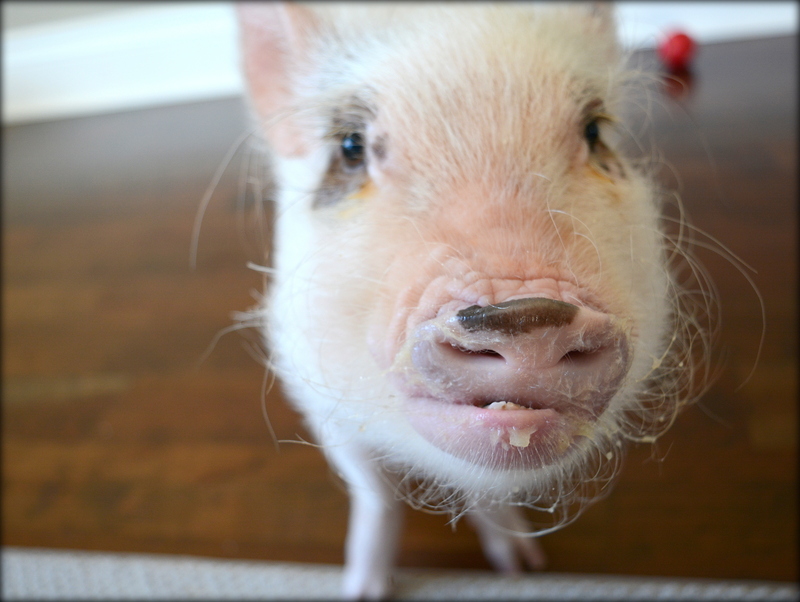 As I’ve written about previously, keeping a mini pig entertained during the winter can be challenging. Oscar loves being outside eating grass and rooting around, so he gets bored and frustrated when it’s cold out and he’s stuck in the house. He doesn’t enjoy playing with toys if they don’t dispense food, so I’ve had trouble keeping him busy without overfeeding him. I’ve really had to start thinking creatively to entertain him this winter. Oscar after getting the applesauce out of the bottom of the applesauce cup. As I was eating lunch the other day, Oscar was hanging out by my feet hoping for some scraps. I don’t ever feed him from my plate because I don’t want him getting used to sharing my dinner (I’m not a food sharer, even with my adorable pet pig), but he always stays close while I’m eating because he’s relentlessly hopeful and persistent. I had thrown together a quick lunch that day and was finishing up eating my applesauce cup. Slightly frustrated that I couldn’t get all of the applesauce out of the bottom of the cup with my spoon, I looked down at an eager Oscar and had an idea. 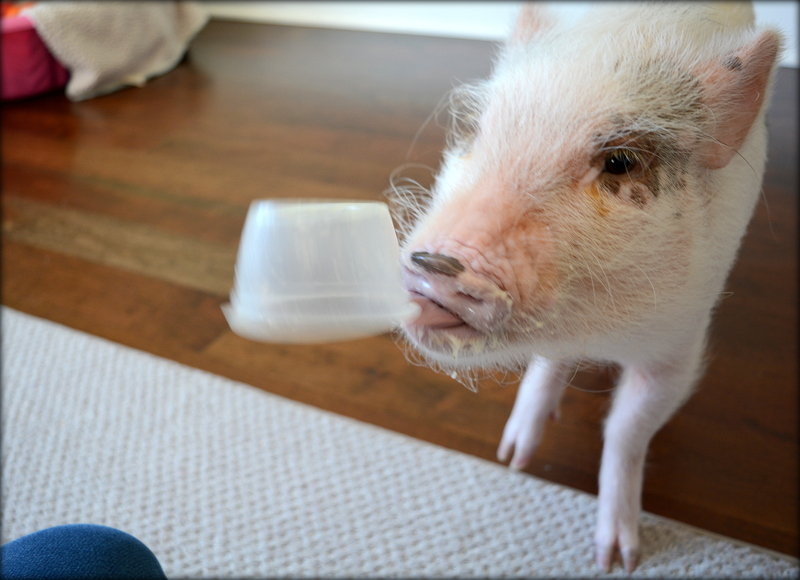 Since my applesauce was natural with no added sugars that might be harmful to Oscar, I decided to give the almost empty cup to him to see if he would enjoy playing with it. There was just enough applesauce in the bottom that he could get a little treat but not enough to overfeed him, and the challenge of figuring out how to get the applesauce out of the bottom of the cup might provide some much-needed stimulation for him during a mostly cloudy, rainy week. Oscar trying to lick the applesauce out of the bottom of the cup. 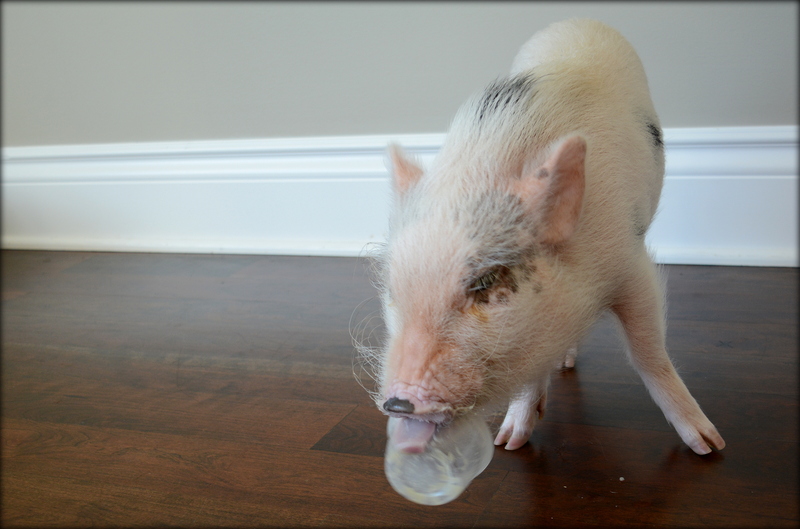 Oscar loved playing with the applesauce cup! He really had to work hard to get to his treat; it was a sufficient challenge paired with a worthy reward that kept his attention for at least ten minutes. I supervised the entire time and took the applesauce cup away after he was finished to make sure he was safe, but I was thrilled to have found a way to truly engage him in something fun for a while. It was a little messy, but he was so happy! Oscar flipping the cup trying to get the applesauce out. The most exciting part was that I found something new to keep Oscar entertained for a while! He was in a better mood after playing with the applesauce cup because it challenged him and allowed him to use his curiosity; he also got to eat a little bit of applesauce! Of course, with any new toy or play idea, it’s important to supervise to make sure it’s safe for your pig, but it can be fun to come up with ways to entertain and challenge them. If you have discovered any creative ways to keep your pig entertained and don’t mind sharing them, please comment below. I would love to hear any ideas that might help us all keep our pigs stimulated and happy! I buy my piggy The Nylabone DuraChew Dog Bone and she plays with it all day. She will not not try to swallow it . She chews on it and drops it and picks it up again chews on it again, but I have noticed that it does make real thirsty, but thats better then having a bored piggy!